Dancap is kicking off their 2012 season with a massive bang. One of Broadway’s biggest recent hits FINALLY comes to Toronto for a depressingly short run at the Toronto Centre for the Arts. Not a frequenter of NYC, I’ve been waiting to see In the Heights for 4 years since it won the Tony for Best Musical, so while my familiarity was low, my expectations were sky-high, and this touring production cleared them with room to spare. Opening night started out a little dicey with the announcement that star Perry Young was out for the evening, replaced by his understudy Jeffrey Nunez. The role of Usnavi- our hero and narrator- is the one originally played by the show’s creator, Lin-Manuel Miranda, so the pressure to nail it is unparalleled (even the Rent replacements didn’t have that kind of hurdle). Usnavi is the make-or-break role of the piece and since I didn’t see Young, I’m sure the everyday experience of this In the Heights is remarkably different from mine, but if Young can hold down the fort as well as Nunez did (and I’m sure he can), the touring production of In the Heights is the next best thing to actually seeing Miranda. The rock opera is dully commonplace these days and we’re all used to the varied traditional styles of musical theatre composers from Rogers & Hammerstein to Kander & Ebb to Schwartz, Brown, Sondheim and Lloyd Webber. The Lion King takes advantage of African influences, 9 to 5’s more than a little bit country and motown’s represented all over the place, but I’d never heard a show take on hip hop, rap and latin music as a storytelling vehicle before; the effect is energizing. Any other style would have felt inauthentic for the Washington Heights neighbourhood at the centre of the story; in fact, it’s the musical style that most helps to define the characters. Nina (the sweet Virginia Cavaliere), for instance, uses a modern musical theatre ballad to express her worries about not returning to Stanford while her conservative father (a standout Benjamin Perez) sings a more classical tune for the stirring “Inutil”. 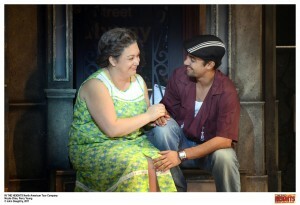 The characters more rooted in the neighbourhood (like Vanessa and her salon co-workers) use more latin influences while Usnavi raps most of his lines. There’s an eclecticism that permeates the neighbourhood and it’s reflected in the ways the characters express themselves. Nunez is a very sweet Usnavi- believable in his puppy love for Vanessa, his brotherly fondness for Sonny, his protective instincts towards the whole block and, most notably, his devotion to Abuela Claudia. 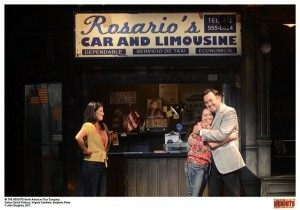 New to the tricky, wordy role, Nunez noticeably flubbed only one line on opening night and covered it nicely. The light-voiced Cavaliere has a lovely presence as the keeper of the neighbourhood’s hopes and dreams but is easily outshone by the sure-footed and full-belt performance of Presilah Nunez as Vanessa (the flashier but potentially less sympathetic role). The actress makes Vanessa’s quest for escape the most engaging uphill battle of the lot, creating a lot of sympathy for the girl in the short shorts and tank top. Kyle Carter is hilarious-turned-charismatic as wannabe-insider and Nina love interest Benny and Christina Aranda’s Abuela Claudia holds down the production with great warm authority. Celina Clarich Polanco gets a little lost in parts as Perez’s wife Camila but she steps out with the powerhouse “Enough” in Act II and leaves an indelible stamp that informs her character up to and beyond that point. Andy Blankenbuehler’s Tony-winning choreography is recreated by Michael Balderrama and a superb ensemble of dancers (including standout performer Sasha Hollinger) to brilliant effect. The dancing is always the third leg of the triple threat for me but in In the Heights it takes centre stage like it hasn’t since A Chorus Line. The city block on stage is a perpetual mass of people, vibrant activity and bustle, making In the Heights the most energizing of musicals I’ve seen in a very long time. Miranda’s insightful lyrics pair with Quiara Alegria Hudes’ strong book to tell a story as clever as it is fun, as affecting as it is colourful (I particularly enjoyed the sweetness of the lyric “Merry Christmas, you old Building & Loan” thrown into Usnavi’s final rap). In the Heights closes on February 19th. Don’t you dare miss it.